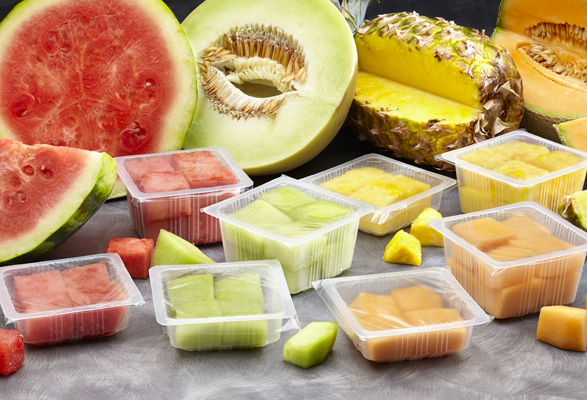 Fresh-R-Pax® Absorbent Food Trays extend the shelf-life of fresh-cut fruits by absorbing the excess fluid that they release after processing. In doing so, they can double the shelf-life of your cut produce. They are especially valuable to processors of high water-content fruit such as: tomatoes, melons and pineapples. Fresh-R-Pax® pads, trays, pouches, and punnets do not dehydrate your fresh-cut produce. They merely absorb the excess liquid that is exuded from it. The removal of this fluid prevents dissolution of your produce’s tissue (e.g. it prevents fruit from turning into a semi-solid mess), it also inhibits the growth of bacteria and moulds, which are other important factors limiting shelf-life. In addition to the economic benefits of increased shelf-life, FRESH-R-PAXTM absorbents also prolong the visual appeal of the produce, by minimising discolouration. The bacterial inhibition also prolongs your products taste and texture. So, it’s a very effective product… and is trusted by some of the world’s most famous fast-food brands. Safety …unlike other products, these absorbents meets EU food contact legislation No 10/2011. For help with your Liquid Adsorbers requirements or any other problems that you have, please give us a call on +44 (0)1628 531900.